Delivering excellent customer service to the target is not always easy. It takes a village to get systems and processes in order so that the customer is not shortchanged and enjoys the experience. Let us look at how customer service + marketing ensures that the customer is happy at any given time. Social media messaging works really well when both departments formulate a strategy that ensures productivity for the brand. The objectives are to dialogue with the target and engage with them as the promotional activities get the party started, so to speak. In all likelihood, the marketing team may not be as social network savvy as the customer engagement department. That is where the two can work in tandem to ensure that with the right resources they can rake in the profits. To understand the expectations of the customer the customer care department plays a vital role. Professional customer care reps provide the marketing team with detailed feedback from the customer and their expectations. The objective here is to take stock of both the positive and negative reactions of the target to improve the quality of the brand through brand building exercises. The objective is to ensure that both teams speak the same language and do not get lost in departmental intricacies or power politics. Cold calling customers by the customer service department takes lead generation to another level as it also employs a strategy where analyzing the mindset of the target is woven into the conversation. It provides a method to comprehend the expectations of the target and work out a method that is a win-win. The objective here is to ensure that the marketing team is not lead astray at any stage. If so, it can raise a false bogey, where the brand will ultimately suffer because the customer service department and the marketing department were not in tandem. Since the first point of contact with a customer is most likely the customer service department the transition from lead generation to marketing pitch must be on point. Once the customer service team has the information relevant to the marketing plan, detailed notes are provided to the marketing team to take it from there. The reality – customer reports may take a while. Once they are read with a fine-toothed comb, can the marketing team work on strategies. A unified approach to targeting the customer should be followed to the tee. This simple step ensures that neither department gets shortchanged. The back office support that customer service departments offer is phenomenal. Once the marketing pitch has been delivered to the client, the follow up is usually handled by an efficient in-house task force. Using this as a medium to build brand value, it enables the customer to connect with the right person on either team. Information from the marketing team to the customer support team should be relevant so that the back office staff can get cracking on the job. Too much of handholding is not required. The efficiency factor comes into play here so that the support process is on point. Consistency plays a vital role like so with a steady flow of ideas between the two departments to ensure that the target is happy. Customer service skills cannot be haphazard they need to be top of the line so that the customer is happy with the experience. 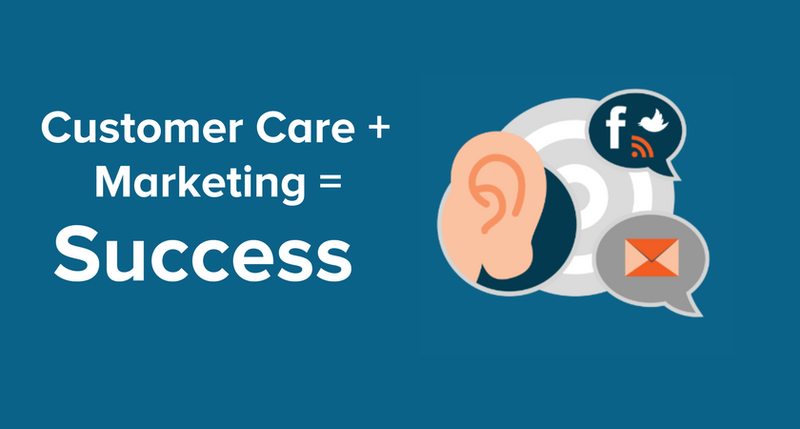 One of the foremost objectives that are similar is an empathetic ear by both the customer care department and the marketing team. The general rule that most companies follow is that the customer is always right, even if s/he is not. The modus operandi is to be there for the customer and understand their suggestions and use this as a step to improvise the brand. From the customer service department it may not be a possibility, but handing the information to the marketing team may ensure a productive angle for the customer. Content creation on social networking platforms has to be simple and consistent keeping the brand’s image in mind. The target should take the bait based on the teaser campaign devised by the marketing team. Once the calls come in the customer service team takes over to provide detailed information to the caller. It is at this time where the team must ensure that they provide the right information. A detailed analysis provided to the marketing team with real-life customer suggestions helps the two departments put the customer’s needs on the top. Following up with the customer by both departments indicates that there is a good rapport with both departments. In a nutshell, when the customer service and marketing teams work in tandem, the customer is pleased. When a customer experiences something interesting from the brand that resonates with their need to buy the product/service, they take the bait and how! To prove the point therefore, the joint task force between customer service and marketing = improved customer experience.